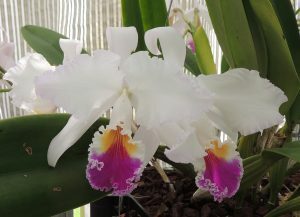 This magnificent Cattleya species is native to Colombia where it grows at around 1000m as a lithophyte on exposed rocks. We find it to be a straight forward species to grow in our Warm America section where we have several clones. The one shown above is particularly strong growing and has reached specimen size with a total of seven flower spikes each with 2-4 large flowers. We are hoping that it will still be fresh for the Malvern show in two weeks time. The species flowers reliably in May/June for us and in cultivation the species can be recognised by the characteristic flowering season, generally light petals and very dramatic purple pink lip pattern. 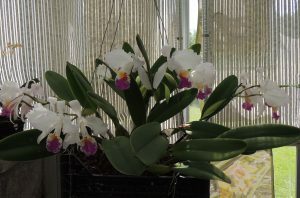 If you are thinking of growing Cattleya species than this one would be a reliable species to start with. We keep plants moist all year but well drained in baskets. Last year we pollinated flowers from two of our best clones to produce seedlings for the future, and I am please to say that the plant shown here is now a mummy with many thousand little green protocorm babies growing in the propagation lab. Expect plants for sale in 18-24 months’ time.